Gardiner's Island is a small island in the Town of East Hampton, New York, in Eastern Suffolk County. It is located in Gardiner's Bay between the two peninsulas at the East end of Long Island. It is 6 miles (9.7 km) long, 3 miles (4.8 km) wide and has 27 miles (43 km) of coastline. The island has been owned by the Gardiner family and their descendants since 1639 when Lion Gardiner purchased it from the Montaukett chief Wyandanch. It is one of the larger privately owned islands in the United States, and is slightly smaller than Naushon Island in Massachusetts, owned by the Forbes family. The island is 3,318 acres (1,343 ha) in size. It includes more than 1,000 acres (400 ha) of old growth forest and another 1,000 acres (405 ha) of meadows. Many of the buildings date back to the 17th century. In 1989, the island was said to be worth $125 million. The island has the largest stand of white oak in the American Northeast. Other trees include swamp maple, wild cherry and birch. The island is home to New York state's largest colony of ospreys, and is one of the few locations in the world where they build their nests on the ground, as there are no natural predators to the osprey on the island. Its structures include the oldest surviving wood-frame structure in New York state, a carpenter's shed built there in 1639, as well as a private airstrip on the south side of the island. 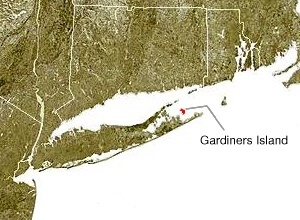 In 1639, the island was settled by Lion Gardiner, who moved there with his family from Connecticut. The island was originally in its own jurisdiction, not part of Connecticut or Rhode Island, long before there was a State of New York. It has been privately owned by Gardiner's descendants for over three hundred and seventy five years. Lion Gardiner reportedly purchased the island locally in 1639 from the Montaukett Indians for "a large black dog, some powder and shot, and a few Dutch blankets." The Indians called the island Manchonake, while Gardiner initially called it Isle of Wight, because it reminded him of the Isle of Wight in England. The Montauketts gave Gardiner the title, at least in part because of his support for them in the Pequot War. Gardiner also had to gain approval for the land grant from James Farrett, an agent of the Earl of Stirling, William Alexander. The Earl of Stirling had been given Long Island by the King of England in 1636. The royal patent of 1639 gave Gardiner the "right to possess the land forever", with the island being declared a proprietary colony. Lion Gardiner was given the title of Lord of the Manor and thus was able to govern the island. On October 5, 1665, after it had been resolved that the English, rather than the Dutch, would rule Long Island, and that it would not be part of Connecticut, Richard Nicolls, the first Governor of the Province of New York, issued a new patent to Lion Gardiner's son David Gardiner. 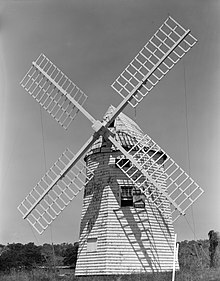 In 1688, when Governor Thomas Dongan granted a patent formally establishing the East Hampton government, there was an attempt to annex the island to East Hampton. However, the Gardiners resisted and Dongan reaffirmed its special status. The island's special status was to continue until after the American Revolution, when it was formally annexed to East Hampton. Gardiner established a plantation on the island for growing corn, wheat, fruit, and tobacco, as well for raising livestock. Privateer William Kidd buried treasure on the island in June 1699, having stopped there while sailing to Boston to answer charges of piracy. With the permission of the island's proprietor, he buried a chest and a box of gold and two boxes of silver (the box of gold, Kidd told Gardiner, was intended for Lord Bellomont) in a ravine between Bostwick's Point and the Manor House. For her trouble, Kidd gave Mrs. Gardiner a length of gold cloth, captured from a Moorish ship off the coast of India (a piece of which is now at the East Hampton library), and a sack of sugar. It is said that Kidd warned that, if the treasure was not there when he returned, he would kill the Gardiners, although trial testimony given by John Gardiner on July 17, 1699 makes no mention of any threats, and Kidd's conduct appears to have been quite civil. Kidd was tried in Boston, and Gardiner was ordered by Governor Bellomont to deliver the treasure as evidence. The booty included gold dust, bars of silver, Spanish dollars, rubies, diamonds, candlesticks, and porringers. Gardiner kept one of the diamonds which he later gave to his daughter. A plaque on the island marks the spot where the treasure was buried. The Gardiners sided with the colonists during the American Revolution. However, a fleet of thirteen British ships sailed into Cherry Harbor and began foraging the island and its manor house at will; they were planning to turn it into a private hunting preserve. Among the British guests were Henry Clinton and John André. At one point, Major André and Gardiner's son Nathaniel Gardiner exchanged toasts on the island. Nathaniel Gardiner was a surgeon for the New Hampshire Continental Infantry. He was the American surgeon who later attended to André before he was executed for spying with Benedict Arnold. Following the revolution, the island was formally brought under East Hampton town jurisdiction. During the War of 1812 a British fleet of seven ships of the line and several smaller frigates anchored in Cherry Harbor and conducted raids on American shipping through Long Island Sound. Crews would come ashore for provisions which were purchased at market prices. During one of the British excursions, Americans captured some of the crew. The British came to arrest then Lord of the Manor John Lyon Gardiner I, who, being a delicate man, adopted the "green room defense" where he stayed in a bed with green curtains surrounded by medicine to make him look feeble. The British, not wanting a sick man on board, let him be. The British were to bury several personnel on the island during the course of the war. Some of the British fleet that burned Washington assembled in the harbor in 1814. Gardiner's supply boats were manned by slaves during the war and this made it easier for them to pass through British lines. Many of the Gardiner slaves were to live in the Freetown, just north of East Hampton village. Julia Gardiner, who was to become President John Tyler's second wife and First Lady in 1844, was born on the island in 1820. From 1854 to 1894, the island was the site of the Gardiners Island Lighthouse. Gardiners Point Island is an island in Block Island Sound that was the former location of the Gardiner Island Lighthouse as well as Fort Tyler. For many years the island was connected via a shoal to Gardiners Island and as such it is under the jurisdiction of East Hampton (town), New York. In 1851 the federal government purchased 14 acres (5.7 ha) on the peninsula from the Gardiners for $400 with the lighthouse first being lit in 1855 after a construction expenditure of $7,000. The lighthouse was in 27-foot (8.2 m) square, 1½ story brick building and had a sixth order Fresnel Lens, fixed white light 33 feet (10 m) above sea level. A March 1888 Nor'easter caused a break in the peninsula permanently turning the point into an island. Between 1890 and 1893 the island was shrinking at the rate of 10 3⁄4 feet (3.3 m) per year. On March 7, 1894, the lighthouse was abandoned and shortly afterward fell into the ocean. A lighted buoy was then moored ¼ miles northeast of the lighthouse. During the Spanish–American War the War Department appropriated $500,000 to build the Fort Tyler battery on the island (named for former President John Tyler who had married Julia Gardiner Tyler who had been born on Gardiners Island). The shifting sands caused problems for the fort as well and it was abandoned in the late 1920s. In 1921 its guns included Battery Edmund Smith, 2 - 8" Disappearing, 2 - 5" (or possibly 8") Pedestal. In 1938 the island was declared a National Bird Refuge by Franklin Roosevelt and transferred to the Agriculture Department. During World War II the fort was used for target practice and was reduced to its present state where it is popularly called "The Ruins." The state of New York briefly considered turning it into a park but it is deemed a navigational hazard because of the possibilities of unexploded ordnance. It is privately owned now. The current manor house was built some time after 1947 by Sarah Diodati Gardiner, who was descended from Lion Gardiner the First in three ways. The previous manor house was built by David Gardiner in 1774 and burned to the ground in 1947; it was thought after a guest fell asleep while smoking. Valuable antiques were destroyed in this fire, while the caretaker saved his own life by jumping from a window. Sarah Gardiner erected a new 28-room manor house in the Georgian style. She died in 1953, still unmarried, at the age of ninety. From 1955 until 1963 Sperry Rand leased the island for top echelon meetings. Sarah Gardiner was a multimillionaire and left the island estate to her nephew, Robert David Lion Gardiner and his sister, Alexandra Gardiner Creel. They took possession of the island at the expiration of Sperry Rand's lease in 1963. Robert David Lion Gardiner, the 16th Lord of the Manor, inherited three Gardiner fortunes from his father, his uncle and his Aunt Sarah. The island was designated as a National Natural Landmark (NNL) in April 1967 by the National Park Service, in recognition of its waterfowl and shorebird habitat, and its role as a breeding ground for osprey. Its NNL status was removed in July 2006 following a request from the island's owner. Owing to the high cost of upkeep, in 1937 the island was put up for sale but was bought at the last minute by a relative, Sarah Diodati Gardiner, for $400,000. Upon her death in 1953, the island passed in trust to her nephew, Robert David Lion Gardiner, and his sister, Alexandra Gardiner Creel. Their aunt had also set aside a trust fund for upkeep of the island, but it was exhausted by the 1970s. When Creel died, her rights passed to her daughter, Alexandra Creel Goelet. Robert Gardiner and Mrs. Goelet were to have a highly publicized dispute over ownership and direction of the island. Robert accused Alexandra of wanting to sell and develop the island. She accused him of not paying his share of the estimated $2 million per year upkeep and taxes of the island. Robert said he would not oppose ownership by the government or a private conservancy group. The case went to court in 1980 and Robert was initially barred from visiting the island, but in 1992, courts ruled that he could visit the island (although the Goelets and Gardiner were not on the island at the same time). We have always married into wealth. We've covered all our bets. We were on both sides of the Revolution, and both sides of the Civil War. The Gardiner family always came out on top. The Goelets offered to place a conservation easement on the island in exchange for a promise from the Town of East Hampton not to rezone the land, change its assessment or attempt to acquire it by condemnation. The Goelets and East Hampton agreed upon the easement through 2025. Lion Gardiner as a proprietary colony, 1st Proprietor and Lord of the Manor. 1639 to 1663. John Lyon Gardiner II ? to 1910. Sarah Diodati Gardiner 1937 to 1953. Alexandra Gardiner Creel and Robert David Lion Gardiner, 16th Lord of the Manor, 1953 to ? Alexandra Creel Goelet, sole owner after the death of her uncle, 2004 to present. ^ Weigold, Mary E. (2015). Peconic Bay: Four Centuries of History on Long Island's North and South Forks. Syracuse University Press. pp. 16–17. ^ Niihau is larger, see: Trebay, Guy (2004-08-29). "The Last Lord Of Gardiners Island". New York Times. ^ Suffolk County Department of Planning (October 2000). "1999 Land Available for Development - Eastern Suffolk County" (PDF). Archived from the original (PDF) on February 18, 2006. Retrieved 2006-04-26. ^ "The Isle of Wight Postcard and Feature Page's summary of information from Newsday". Round-the-island.co.uk. Retrieved 2012-03-26. ^ New England Historical and Genealogy Register, Vol. VI, pp. 72-84. A verbatim report of John Gardiner's testimony taken before a board of government commissioners at Boston. ^ "Gardiners Island Lighouses". East End Lighthouses. Archived from the original on 2012-01-29. Retrieved 2012-03-26. ^ National Registry of Natural Landmarks. National Park Service. 1989. p. 79. Retrieved November 20, 2016. ^ "Notice of Multiple National Natural Landmark Boundary Changes and De-designations" (PDF). Federal Register. 71 (138): 41050. July 19, 2006. Retrieved November 20, 2016. ^ a b c "Robert D.L. Gardiner, 93, Lord of His Own Island, Dies". New York Times. August 24, 2004. Retrieved 2014-01-29. Robert David Lion Gardiner, the last heir to bear the name of the family that has owned Gardiner's Island, off the coast of Long Island, for nearly four centuries, died yesterday at his home in East Hampton, N.Y. He was 93. ... Mr. Gardiner called himself the 16th Lord of the Manor and saw himself as a custodian of his family's history on what is said to be the largest privately owned island in the world. ^ "John Lyon Gardiner Dead. Owner of Gardiner's Island, Associated with Capt. Kidd, the Pirate" (PDF). New York Times. January 22, 1910. Retrieved 2014-01-29. This page was last edited on 15 March 2019, at 11:46 (UTC).